Easy freeway access. Brand new LUXURY resort with concrete pads up to 100 ft long. No rig is too big. Wine tasting coupons. 15 min drive to wineries. Club house seats 100+ for group meetings. Heated pool and spa. Much more. I stayed at Yanks in Greenfield while playing golf courses in the Pebble Beach area. I could have stayed at a location in the Monterey area but I could not find one that I felt comfortable with in Monterey. I decided that I would rather stay at a Good Sam campsite that is highly rated than some lower rated campsite in Monterey. I'm happy I did. 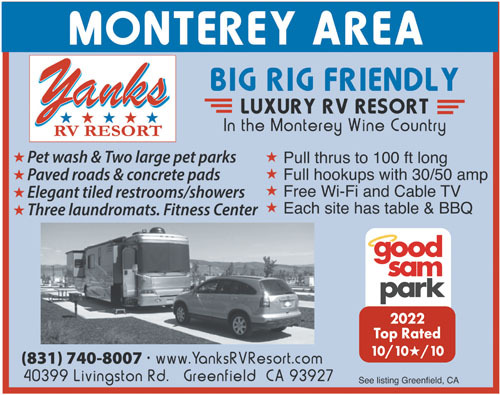 The traffic is somewhat of a hassle but Yanks is an awesome campsite for an RV. The facilities are great. The only downside are the showers and the one toilet. There are only two and they have a design flaw that allows the water from the shower to flood the area outside the shower. It is not a big deal however you slippers may get wet. It appears they are building another bathroom building that is being tiled now. Anyway this is one of the best facilities I've stayed at in my 3,500+ trip that covered AZ, UT, MT, Alberta, British Columbia, WA, OR and CA. I would go out of my way to stay there again. The site was about $59 per night with the Good Sam discount. This is a relatively new RV park built as part of the Yanks Air Museum project. It has asphalt driveways and concrete site pads. Most sites are pull thru with a few back in sites. Each site has beautiful landscaping and nice grassy areas at both ends of each row. It is a very pleasing look. 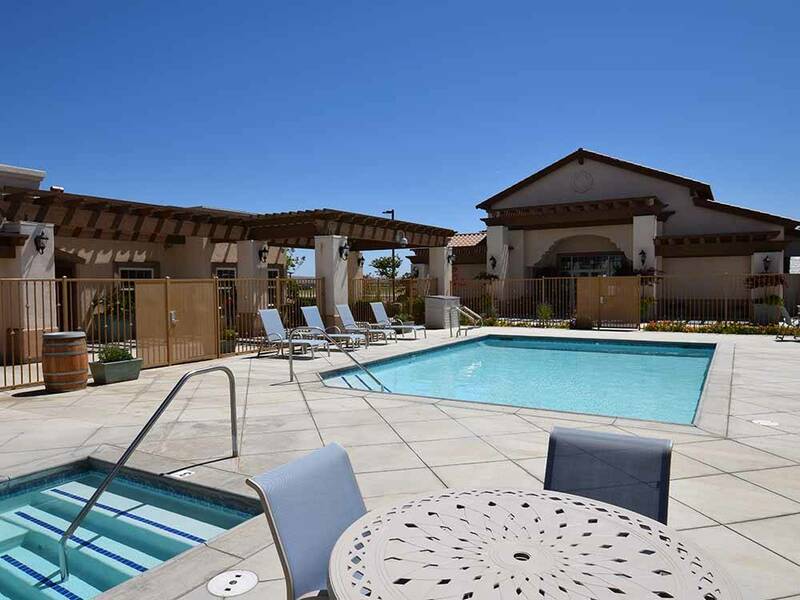 There is a pool, exercise room and laundry. The restrooms and all other areas are very clean and well maintained. We had a back in site with 50 amp electric and cable. If you are traveling on Highway 101 it’s well worth making a stop here. We paid $45 per night based upon a weekly rate. How beautiful! The views of the mountains and stars (limited light distortion) are amazing. Clean facilities, friendly staff, amazing new park. Keep in mind the wind factor, awnings must stay up. Extremely nice campground, very new. No shade yet due to how young the trees are. VERY windy, there is even a disclaimer of liability on the site map about the wind. Heating bathrooms, which was nice on early April mornings. Great dog park! I took off a star for the bathrooms as it was so dark in the shower area they second time i took an LED lantern with me so I could see the faucet handle. There were no burnt out lights so, but the only light was approx a 20 watt bulb in a recessed can too far from the stall to help much. This was a great surprise to find, this is by far the nicest , cleanest , friendlist park we have stayed at. A true gem. Once the trees mature and get larger it will be even greater if that is possible. Wonderful park in a great location. We stayed here for two weeks in late July/Early August. Most of the Sites are pull through and super easy maneuvering even with the largest rig. The staff were super friendly and helpful. Level concrete pads. The hookups are modern and convenient. The only "problem" was; that as a new park, the trees are still young and short and don't give much (if any) shade. The constant 10-20 MPH winds make it impossible to deploy an awning or leave folding chairs unattended. Despite the annoying winds I would gladly come back... This place is well cared for, well located, well equipped. Will get 5th star when I come back to enjoy planned aircraft museum. All spaces are paved and well spaced out. New park so very little shade. Easy entrance from 101 FWY. Pool and hot tub kept at good temps and clean. Fitness center is small, but has what you need.